This was only a makeshift transition so all we had was our bike boxes and no gear bags. I had fortunately put all my bike clothes in my bike box so I was able to change out of my wetsuit into dry gear. Sean and Mike had dry gear too but Peter was not so lucky and he had to beg, steal and borrow dry clothes. There was a few marshals around to help us get on the road as quickly as possible including a couple of racers whose teams had been forced to retire. This meant we had loads of help making up our bikes and packing up our wet gear and in very little time we were cycling off on the road to TA4. Before leaving Galway, Sean took us on a detour down Shop Street for chips. It was packed with pedestrians and Mike was a little nervous about being back on his bike for the first time since the accident and I was confused. I thought we were in Kinvara. But they were good chips. Shortly after we set off again, I realised I’d left my rucksack in the chippers so I had to drop my bike and sprint back up the road in my bike shoes to recover it. Out of Galway, through Oranmore we went and about 30k down the coast till we reached transition at 21:50 on Friday evening. At registration we were given the opportunity to be involved in a research project that was being conducted by medics from UCC. The study was looking at the ability of endurance athletes to cope with extreme physical stress, sleep deprivation and mental stress. By taking blood samples before, during and after the race they would be able to examine biomarkers that reflect the function of the heart, kidneys, muscle, immune and metabolic systems. And this, as well as being really interesting, would provide a means for improving future performance. Our first blood samples were taken at registration and at TA 4 the doctors were on hand to take mid race samples. I got mine done first and then raided their chocolate supply before diving into my kit bag for supplies for the next stage. Mike was under a bit of pressure because as well as getting his bloods taken and sorting out his gear, he had to meet with the organisers to be told about several route changes affecting a number of maps. And transition was closing at 11pm on the dot! We were the second last team to leave at 10:59pm on the road to Ailwee caves, where we had two control points to pick up. The night was cold and wet, although we warmed up once we were cycling and we reached the caves just before midnight. There was a couple of teams in the cave but by the time we’d changed into trekking shoes and Mike had taken the cleats out of his bike shoes, we had a clear passage. The bikes came in with us as we went deeper into the caves until we reached a barrier where we left the bikes and continued down into the heart of the caves with waterfalls thundering on either side. There was some climbing to be done and some teeny gaps to wriggle through …. …. before we dibbed our controls and headed back to the bikes for a magical bike back to the outside world. It was pouring rain at this stage and even the large campfire that was burning outside the caves was unable to stave off the cold. We wanted to put up the tents for a sleep but the caves were closing and as we were concerned that we would be locked inside the complex, we cycled a few kilometres down the road looking for a spot where we could get some shelter from the wind and rain. That spot was behind some ditches but it did the job and we stayed there until dawn. On awakening we continued on our journey down the coast, heading for the Cliffs of Moher and our next control points. First though was a stop for breakfast in Doolin, where we devoured four full Irish breakfasts and a mountain of toast. It was very windy when we got going again and as we reached the cliffs it had strengthened to gale force. It took a while to find the first control because it was in a quarry and we thought we didn’t have access rights. 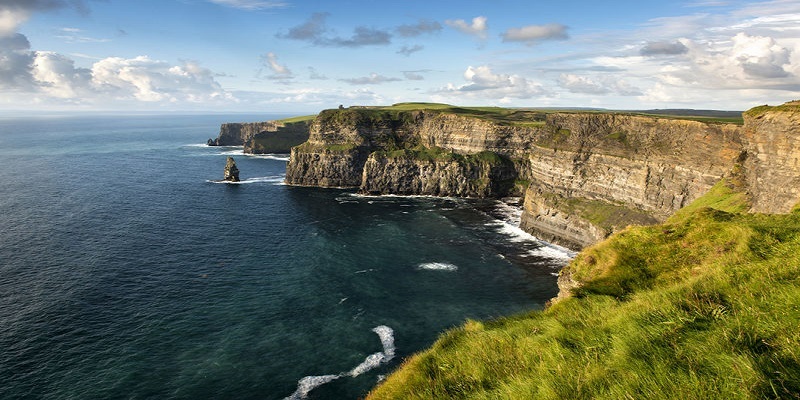 The second control was at Hags Head, which is the most southerly point of the Cliffs of Moher. The cliffs here form an unusual rock formation that resembles a woman’s head looking out to sea. As you would expect this is a popular tourist attraction but as it wasn’t yet mid-morning, the narrow path that leads up to the point wasn’t too busy. We were pushing our bikes because of the wind but we were still moving along at a good pace and we caught up to a couple who were on the path in front of us. They weren’t too obliging about letting us past and when we did try to they kept speeding up and slowing down again. About 100m from the top the bank flattened so we moved to overtake them here. Mike jumped down in front. I was following but as I went to jump down a gust of wind caught my bike and the bike and I both did a somersault narrowly avoiding the gentleman who exclaimed loudly ‘C’est dangereux’. I apologised and soon we were at the top and dibbing our next control. We left Clare on the bikes and proceeded towards the ferry which would take us across the Shannon into Kerry. The ‘ITERA’ ferry had to be cancelled due to the high winds and that meant we had a slightly longer bike to the commercial ferry. We bumped into the Japanese team a few times here as we were stopping for food. Peter was struggling here a bit and we had to force feed him a couple of times with Coke and jellies but we were using our pace line to good effect and the last 20k before the ferry Peter and Mike were bombing along as we rushed to make the 17:30 ferry. I was dropping off the pace but Sean was back with me and he was giving me a push up the hills to make it easier. We came into Killimur at 17:10 which gave us a bit of breathing space. As we were ascending the last hill Peter fell over on his bike, a combination of fatigue and low blood sugar and I think we were all glad to finally get on the ferry and have 20 minutes to relax and recover! We got off the ferry in Tarbet and after another food stop at a garage we battled on into the headwind. We had decided to skip the coasteering because Mike wouldn’t be able for it with his collarbone and Peter didn’t want to do it and we’d also ruled out the trekking in the Brandon Mountains because of time shortage/feet issues so it was a long bike to TA6. Shortly after we had passed the road down to the coasteering, we stopped for a 15 minute nap. One of the organisers, Jim, caught up with us here and told us that there were further route changes, the swim that became a paddle was gone, the bike along the Kerry Way was gone and we now had to make our way to a new transition in Glenbeigh. This was potentially good news as the Kerry Way would have been a tricky nav although it meant a very long bike had just become a bit longer. We had a small hike a bike around Tralee where we had to lift our bikes over a heap of gateways and we had to follow a narrow walkway. Mike was fading badly here and he fell off his bike, luckily onto his good shoulder and before we started the long steep ascent up the Conor pass, we pitched the tents in a field and slept for a couple of hours. The bike into Glenbeigh was pretty straightforward after that and it was four very happy adventure racers who rocked into the hall at Glenbeigh in the early hours of Sunday morning (05:40), ready to pack away our bikes and start on the trek up Carrauntoohill.